A duple metric structure has pulse streams related in 2:1 proportions, with each stream arranged in a strong-weak accent pattern. Sometimes, a 4:1 proportion is strongly communicated between two (visually) non-adjacent levels of pulse. Also, the accents that produce the strong-weak pattern may themselves vary in strength. Choosing a note value for one of the pulse streams will then determine the note values of the remaining three. In Example 26 below, the quarter note has been chosen to represent the level C; this fixes the note values for all the other levels. What would the note values of the other levels be if the quarter note was chosen to represent level B? or level D? there should be several slower pulse streams represented in the metric structure. you should be able to hear and tap two slower pulse streams and one faster. two faster pulse streams and one slower stream should be easy to hear. This level may be relatively difficult to hear and tap; but its function, to show the pattern of the whole note stream as strong-weak, is essential. 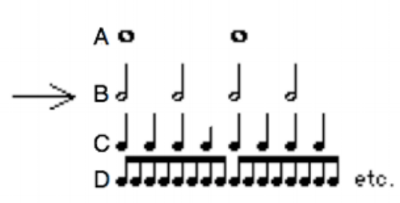 In this movement, the whole note is easily counted as the beat. might also appear as the signature. 4/8 or 2/8 or even 4/1 are possible, though unlikely. It turns out that Haydn chose cut time (see the score in Burkhart, 5th ed., p.166). “4” or “8” could have served as the lower number in the signature; there is no way to tell specifically from the sound. It was conventional at the time to use cut time for very fast tempos, but other signatures representing this metric structure at the same tempo occur frequently as well.